After reading Mario's blog yesterday I was remembering my first trip to Scotland as well. As I blogged about earlier, I was a late in coming to Scotland. It was definitely on my list but there were so many other places I wanted to see as well. I had no idea that Scotland was going to affect me the way it did. I was told by several members of my family that I would be overwhelmed but it still did not prepare me. On my first trip I prepared very heavily and I rented a cottage in central Scotland for several weeks so that family members could come and go as they were able. I wanted to make sure that I found someplace very central so that we could make day trips from a good location. Much to my surprise upon arriving to the cottage we were informed that the tower in the next field marked that exact center of Scotland! Over the years we have rented several cottage but that first month in central Scotland made the area very much home. For the first week we were at the cottage it was just my mother and I. We were spending seven weeks and so we really made ourselves at home. As the Lion and Unicorn pub was just up the road we knew we had to try it for dinner. The pub is almost 400 years old and is often in the top ten. We of course have returned several times over the years. We also fell on love with Doune and Doune Castle, Stirling and Stirling Castle and the lovely wee village of Callander. I was remembering a trip that my brother Cameron joined us as well as my sister Pamela and her daughters Hayley, Kelsey and Callyn Rose and of course mom. On the first trip that Callyn was on we went to Loch Ness as it was high on the girls list. I think Callyn was six at the time. We hired a boat captained by John Minshull. We had the whole boat to ourselves and John had Callyn piloting the boat all around the loch. The most amazing thing about this was that we were at Loch Ness six years later with the girls and Callyn was twelve years old then. John immediately recognized her and said he hadn't seen her since she was half that size? What an amazing memory! Callyn once again piloted us around Loch Ness. 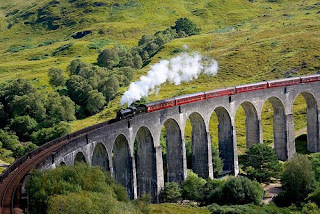 We went for a ride on the Jacobite Steam Train that is also known as the Harry Potter Express as it is used in filming the movies. I booked a car for us but war really not thinking about Harry Potter. Once we were on the train we had many little faces pressed upon the windows to see into our car as it was where most of the filming took place. I had no idea, I just stumbles upon in. A year later we were at Loch Shiel taking a boat trip on the Loch and found that we had missed the Potter kids by two days as they had been filming on the loch and had used that boat. I think with the girls we have been to almost all of the Harry Potter film locations. We have had many adventures that happened purely by chance. I had booked us a journey on the Strathspey Steam Railway one day and found ourselves in a rail car that had been retired in 1954 and had been renovated and just returned to service that day! Tomorrow I will have to share the story of when I tried to take the girls across the border and into England! The adventures continue to happen and that is why I love taking people to Scotland and to the rest of the British Isles. Either family members or people who have joined our tours. We started our tours to resemble our family holidays and as it is so popular we continue on today was we started out 9 year ago.